Your blog is one of the best tools you have to make and nurture connections. This is where you put a human face on your business and where you can build trust and brand loyalty. 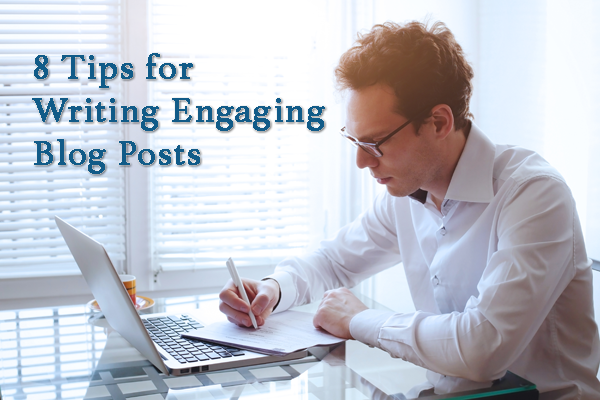 That starts with writing engaging blog posts that will engage readers and keep them coming back for more. People react favorably to real stories by real people. Your words can show people where you came from, your inspirations and what your work means to you, and can inspire readers to connect with their own passions and tell their own stories. Your stories can inspire, share perspective, provide valuable information, make people smile, and create a positive vibe for your brand. Readers want to be entertained, but they also want to be educated or enlightened. If you can establish yourself as a resource that brings them information, and insights that will help them or enhance their lives, they’ll keep coming back for more and will turn to you for guidance when they need information. For example, today’s Millennials, which make up the important 18- to 35-year-old demographic, are known for a cost-versus-benefit approach. At least statistically, they want to benefit from what they do, read, and consume, rather than make these choices by rote or sense of responsibility. Some consider this a selfish approach, but Millennials are also known for generosity and brand loyalty, so if they’re part of your target audience, court them with content that brings them value. You want people to value what you have to offer and trust you as an expert in your field, so writing about your industry is vital, but if you only cover topics related to your products or services, you’ll miss out on opportunities to connect. Varying your topics helps you reach a wider audience and increase the potential of interest in your posts. Share tips that will be useful to your target audience, post about valuable lessons you’ve learned and ask readers to share their own experience-based wisdom, write occasional fun/funny posts, and take advantage of the buzz of (non-controversial) current events to create your own spark. You can often creatively tweak your story so it winds its way back to your brand or industry. Because many people don’t generally read beyond the headlines, it’s important that your headlines attract attention and make readers want to know more. They should be short and sweet, with carefully selected wording that either makes use of target keywords or are designed to be eye-catching (or both). Hook and reel the reader in right away, ideally with your first sentence. You don’t have the space to weave together a clever opening that goes on for several paragraphs. Your opener should either surprise and attract the reader or illustrate the topic of the post and how it will help them. Online content needs to be more easily digestible than a print product. That means shorter sentences, shorter paragraphs, and shorter posts, and breaking up your posts with subheads and bullet points. Readers are fickle and will move on if they are faced with content that’s hard to follow, especially on mobile devices where they may have limited viewing space. Make every sentence count as you work toward creating flow in your posts. Strive to move seamlessly from one section to the next, work in crucial keyword phrases naturally, and keep an engaging tone throughout. To ensure good flow, read your post aloud when it’s done. If anything feels distracting to you, it probably will be distracting to readers as well. If you have a strong email and social media following, share your posts on all or most of your platforms. You can benefit from the exponential sharing among your followers, their followers and their follower’s followers. Take advantage of Google Plus communities and LinkedIn Groups to promote your posts among your peers. Being active within those groups will help generate interest in what you post. Use web tools such as SumoMe, Twitter Cards and Scoop.It to get the word out and increase engagement. Tap into the power of influencers on social networks, particularly LinkedIn, with mentions in both your blog posts and on social media. Discussing these influencers can put your content into the hands of the huge audiences that follow them. You can also pay to promote a post on Facebook or sponsor a tweet, Stumble or LinkedIn post. Your blog is a drop in a very big pool, so the more you can do to be engaging, create buzz, and network with your peers, the more exposure your posts will enjoy. Christoph is a marketing and customer-experience practitioner who is committed to understanding customer needs and business objectives. As marketing manager for Walsworth, Christoph enjoys informing customers about solutions that can improve their success.